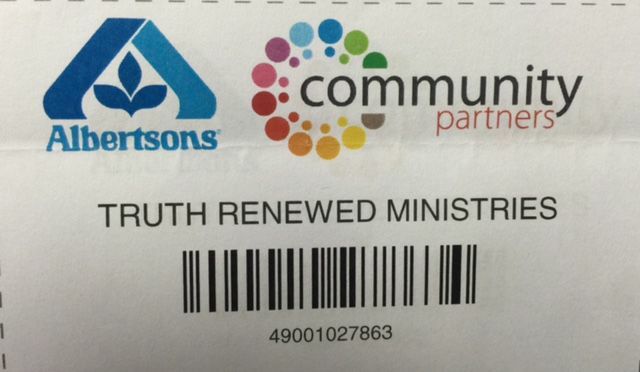 We're excited to share with you some really cool news; now you can support Truth Renewed's mission every time you purchase goods from Amazon smile, grab groceries from Albertson's, Kroger, and Tom Thumb. How cool is that? It's really easy just click on the icon and you'll be taken right to the page. Side note: add them to your favorites! Click the amazon link and smile while you shop. For you Kroger Shoppers, click the logo below and you'll be taken to the login page first. Email truthrenewed@gmail.com with your address and we'll mail you one.